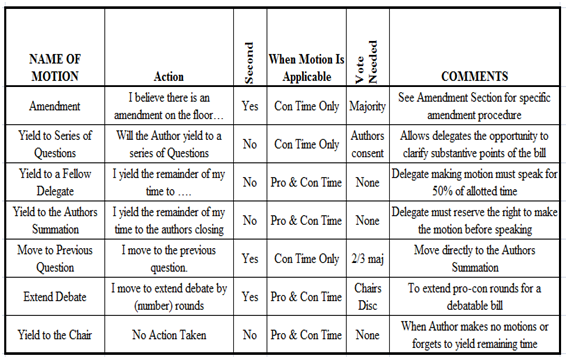 Motions can be made by any legislator in both committee and chamber sessions (though some variations do exist). Motions are to be made by rising and addressing the Chair in the approved manner and then stating the motion. The Chair shall then restate the motion. The Chair has the right to require that all amending motions be submitted in written form. For those motions that are debatable (amend, reconsider, suspension of rules) the Chair may permit the mover and one opponent of the motion two (2) minutes each to speak on their position. The Chair shall conduct a vote and report the results on the motion. Amend (vote required – majority). Any bill may be amended. An amendment must conform to the subject matter of the bill. Only one amendment to an amendment can be offered. Previous Question (vote required – 2/3). Its effect shall be to cut off all debate and bring the chamber to a direct vote, first upon any pending amendments in their order, then on the bill. Reconsider a Vote (vote required – majority). This motion is made when a vote has been taken and a member desires to reconsider the vote by which the bill, amendment or proposition was passed or defeated. If the motion carries, it brings the matter back before the membership for further consideration. Any member who voted on the prevailing side may make this motion. No question can be reconsidered more than once. Suspension of the Rules (vote required – 2/3). This is a motion to suspend the operation of the rules of order that the particular body has adopted in order to permit consideration of some pressing matter out of its usual place. Requires the consent of the Chair to be in order. Withdrawing a Motion (vote required – majority). When a motion is before the chamber, the mover and only the mover may withdraw it by rising and moving for its withdrawal. Point of Order (decided by the Chair). A member rising to a point of order must be recognized and then state the point. It must pertain to the rules only. Appeal (vote required – majority). The appeal from a ruling by the Chair may be made by any member. When voting, the “ayes” are votes for the Chair, the “nays” are votes in favor of the appeal. A tie vote sustains the Chair. Point of Information (decided by the Chair). This is used to question another member of the chamber. Point of Personal Privilege (decided by the Chair). Used to request permission to leave the session. Adjourn (vote required – majority). Due to the time schedule of the program, adjourning is permitted at the prescribed times only.